A great treatment should go hand in hand with great products. We carefully select skincare ranges and products that meet our high expectations and, most important of all, bring you the best possible results. How you treat your skin at home matters and has a significant impact on the results of our treatments. That’s why all our packages include a cosmeceutical product so you can continue to benefit from our treatments, at home. IPL Photo Rejuvenation will lighten sun damage, age spots and freckles, reduce redness, rosacea, dilated blood vessels, control flushing or improve your skin’s texture through collagen stimulation. Prevent lines from forming or stopping lines from getting deeper with a Wrinkle Relaxer. Prevention is always better than a cure! 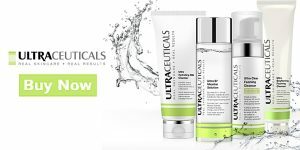 Ultraceuticals B2 Micellar Solution is an ingenious no-rinse cleanser that utilises ‘micelles’ which act as gentle magnets to capture dirt, excess sebum and make-up without stripping the skin. Free from parabens, alcohol and other nasties. HydraFacial enhances skin tone, texture and hydration level. Get instant results with a non-invasive, multi step treatment that provides cleansing, exfoliation, extractions and hydration with no discomfort or downtime. The procedure is immediately effective. AHA Peels (Glycolic/Lactic) are excellent at resurfacing the skin and it also increases the skin’s moisture levels. It loosens the thickened surface layers that appear as dry, rough, scaly skin and stimulates the production of collagen in the deeper layers. Ultraceuticals Exfoliating Gel contains exfoliators, Jojoba esters and AHA’s to help decongest and remove surface impurities without stripping skin of vital moisture. The Clear and Brilliant is a revolutionary, gentle laser skin care treatment, clinically proven to fight the natural effects of ageing skin. It is safe, non-surgical and non-invasive whilst helping improve tone and texture and gives skin a radiant, youthful glow. It creates a more even skin canvas, with reduction in the appearance of pores. Ultraceuticals B2 Micellar Solution is an ingenious no-rinse cleanser that utilises ‘micelles’ which act as gentle magnets to capture dirt, excess sebum and makeup without stripping the skin. Free from parabens, alcohol and other nasties. 1 IPL Photo Rejuvenation + 2 Brightening Accelerator Masks + Ultraceuticals Brightening Cleanser + Ultraceuticals Brightening Serum + Ultra Brightening Moisturiser. IPL Photo Rejuvenation will lighten sun damage, age spots, freckles and improve your skin’s texture through collagen stimulation. Brightening Accelerator Mask visibly diminishes mild to advanced stages of pigmentation and helps prevent future skin discolouration. The ingredients in the mask work to rapidly break down melanin within the melanocyte, accelerating the breakdown of hyperpigmentation. Ultraceuticals Brightening Foaming Cleanser features a brightening complex of vitamin B3, provitamin B5 and soothing cucumber extract. Thoroughly cleanses the skin leaving the complexion luminous. Ultraceuticals Brightening Serum helps reduce the appearance of mild to advance hyperpigmentation like never before. This unique formula features proven skin brighteners with powerful exfoliants. Ultraceuticals Brightening Moisturiser works to strengthen the skin’s lipid barrier function while restoring vital moisture levels within the skin. Formulated with a complex of skin brightening ingredients, this potent formula leaves the complexion looking brighter, more even & radiant. IPL Photo Rejuvenation reduces redness, rosacea, dilated blood vessels, controls flushing and improves your skin texture through collagen stimulation. Ultraceuticals Red Action Moisturiser nourishes and soothes sensitive, redness-prone skin. Contains powerful ingredients to promote the healthy barrier function of the skin and visibly reduce the appearance of facial redness. Ultraceuticals B2 Hydrating Serum utilises the power of provitamin B5 and vitamin B3 combines with high levels of hyaluronic acid to synergistically help restore vital moisture balance and provide long lasting hydration. Jessners Peel is a great treatment for those who have oily skin concerns and the associated skin conditions arising from oily skin. This peel will visually retexturize thickened or oily skin, improve the appearance of enlarged pores, pigmentation and exfoliate the skin’s upper layer, which then allows improved absorption of products. Ultraceuticals Clear Foaming Cleanser helps control surface shine, remove impurities and unclog pores. This non-stripping cleanser soothes and conditions skin leaving it deeply clarified and perfectly balanced. Ultraceuticals Clear Treatment Lotion is a multi-action treatment serum that helps to visibly improve skin that is affected by blemishes. This state-of-the-art formula combines powerful exfoliators to decongest skin with antioxidants and skin-soothers to reduce redness and irritation. Ultraceuticals Purifying Mask is a clarifying, non-drying clay mask helps absorb excess sebum, remove surface impurities and soothe irritation. This masks leaves skin looking healthy, soothes & clarified. Skin Needling is a skin rejuvenation treatment that helps to support the regeneration of collagen and elastic through a natural skin healing process. Medical grade stainless steel needles are passed across the skin creating micro channels. These channels allow for increase product penetration as well as activating the skin’s natural healing response. The treatment is designed to support skin regeneration to help improve the skin texture. This treatment can also improve the appearance of acne scars, stretch marks & surgical scars. LED Light Therapy activates collagen production to improve the visible signs of aging, to restore glowing, healthy-looking skin. It can also be used to reduce age spots, sun damage and overall redness, flushing and dilated capillaries. Results are often immediate. A thorough consultation is performed to classify your skin according to its pigment content and your skin’s reaction to the sun. An ideal candidate for this treatment would have medium to dark hair and a medium to light complexion. A test patch is required prior to this treatment and to also determine your treatment plan.